kiwisa (North Shore, New Zealand) on 18 June 2013 in Miscellaneous. 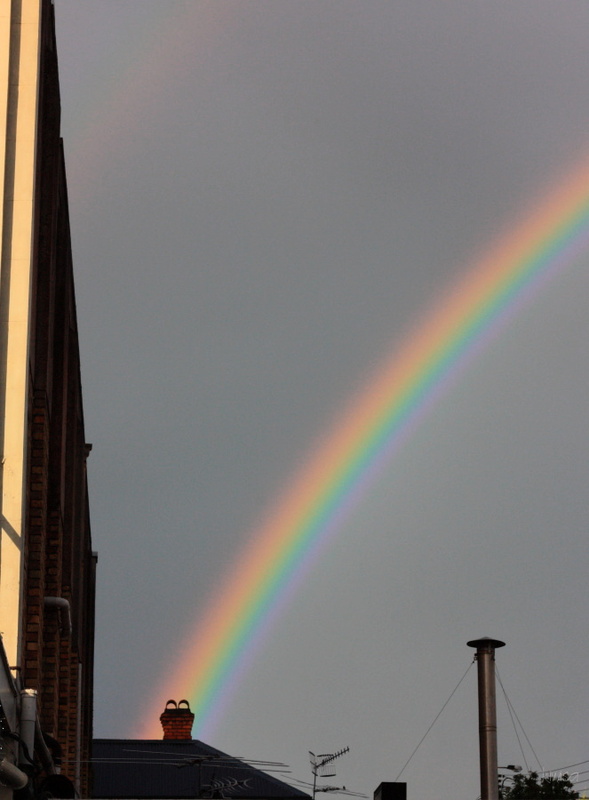 Do you think the pot of gold is in the chimney pot? Happy ST. I wonder if the owner of that house had a pot of gold in their fireplace....great colours and I like the way that the chimney is lit up - well spotted! @Jypyä Pop: It is good to know where it is, isn't it? Today we have more than one ... I guess it will be a lucky day for everyone ... A hug Frances...! A nice composition and a beautiful rainbow, the picture is magnificent, I like a lot. Clear shot of rainbow colors. Like it ! Il faudrait aller voir :) Splendide shot. Happy ST.
Superbe arc en ciel ! Gorgeous composition, gorgeous rainbow ! I love it ! So that's where the leprechauns live-in a chimney! Impressively intense rainbow! Great capture with an excellent composition. Wow, that fantastic! I do that must be gold! The rainbow is a dead giveaway.